Here in Australia the freestyle form of swimming is known as the Australian Crawl. In America, in the 1967 World Book Encyclopedia at least, it is known as the American Crawl. Here in Australia in the late 1970s and then the 1980s there was a very popular rock band called Australian Crawl. One of their albums was called Sons of Beaches. It was recorded in Hawaii in 1982, and included a song called Daughters Of The Northern Coast. Was there ever a rock band called American Crawl? Methinks not. 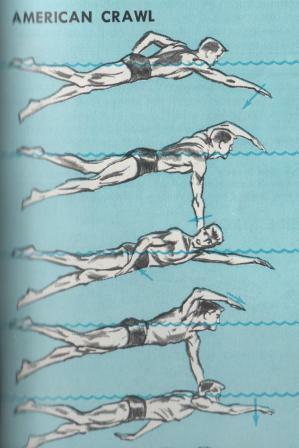 But the 1967 World Book Encyclopedia does point out that ‘the American crawl developed from a racing stroke introduced about 1900 by Richard Cavill, an Australian swimmer’. It also notes that ‘the ability to swim does not come naturally to man, as it does to fishes, frogs and many other animals’. I can’t argue with that – it still doesn’t come naturally to me, despite the daily dips. Plenty of cold northerly winds this past week, meaning clear, calm water. And then a ride into the wind to get home. I’ve had this drawing pinned on my noticeboard for some years now. It’s from a terrific publication called The Mariner, which began in July 2001 and ran until July 2003. Its editors were keen swimmers and presumably still have a dip every day in Port Phillip Bay. The Mariner was a 16 page monthly black and white newspaper with news stories about Port Phillip Bay and the Mornington Peninsula, and regular columns about knot-tying, shells, lexicography and seaside gardening. It was a fun read, a real treasure. I did some real mowing this week. Backyard grass, not sea grass. 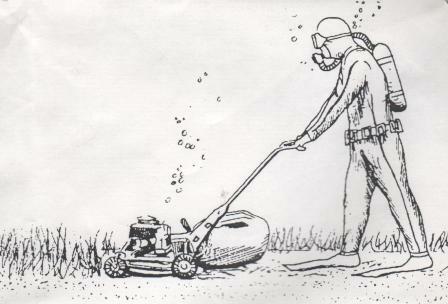 ‘Didn’t need the wetsuit or the flippers or the oxygen tank. ‘Had a quick dip at Fairhaven this week, and another at Eastern View, just down the road. Usually my daily dips are in suburban Williamstown, but I had a chance to get down to the coast for a few days. Fairhaven beach was pretty much deserted when I popped by on my bike, on my way to buy the morning paper from Skinny Legs Cafe in Aireys Inlet. The picture above (courtesy of Flickr) is from sunnier, warmer, busier days. Fairhaven was the (un-named) setting for a story I wrote about 12 months ago, about an old man caring for his frail wife. I called the story Erosion. The editor gave it a slightly different name. Photo courtesy of Flickr & Creative Commons. The pelicans were hungry last Sunday morning. 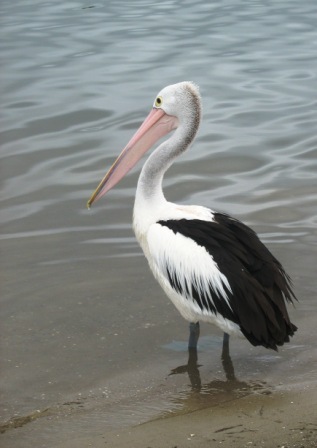 Usually pelicans in Williamstown feed at the fishing club jetty opposite the life-saving club, or around the corner at the private moorings near Jawbone Marine Sanctuary. But last Sunday morning there must have been plenty of young fish amongst the rocks in the middle of the swimming beach. I’ve often snorkelled there in the shallows and some sunny days there are thousands of juvenile fish turning, as one mass, into all sorts of shapes. You wave your hand and they move one way. You wave your hand again and they move another way. Magic. So the pelicans, about 20, were probably feasting. But they were also cruising back and forth by the shore and then picking food from the washed-up seaweed. One pelican managed to scoop up a large spiky bloated catfish from the seaweed. I watched the pelican as I was drying and wondered what all those spikes would do the bird’s digestive system. The pelicans were hungry last Sunday morning. Okay, so this wasn’t the scene down at Will beach during the past week’s swimming. It is Williamstown beach, though. February 1996. I was there with our young family. And hundreds of others. 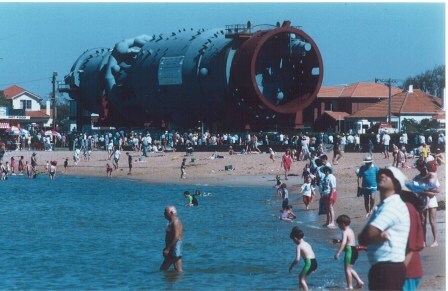 The rather large object very slowly making its way along the Esplanade is called a catlytic converter. No, I don’t know what that means either. But it was on its way from a ship at Williamstown to the Altona oil refinery: a journey of about five kilometres that took five prime movers and a few days’ work, including removing power lines temporarily. 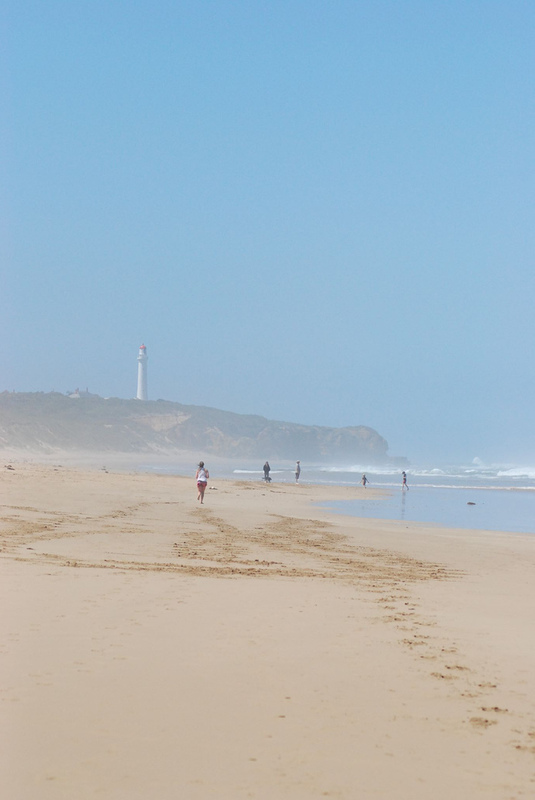 Rodger Young’s excellent photo shows that Willi beach can get fairly crowded on a warm day. But what about the white-hatted chap in the foreground on the right hand side? Did he miss all the action? 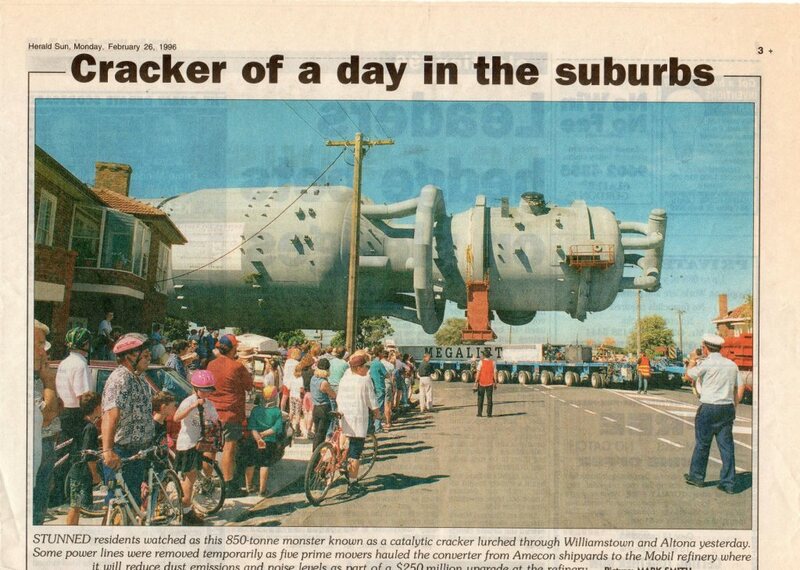 Shaun Tan’s wonderful 2008 book Tales From Outer Suburbia features an illustration based on the photo below. Shaun Tan calls the rather large object The Amnesia Machine. Swimming has been in the news lately, Olympic swimming in London of course. And the Australian media has been talking about swimming caps a little. White caps. Gold caps. I’ve got three caps. The grey cap, from France, was a Christmas present last year. The yellow cap I found on the Port Melbourne beach earlier this year. The white cap I bought last summer after I stretched a red cap a little too far. ‘Cap season’ for me is from May to November. I only wear one cap at a time. Some people prefer two. Maybe even three. Some wear rubber balaclavas: a sort of wetsuit hoodie for the water. 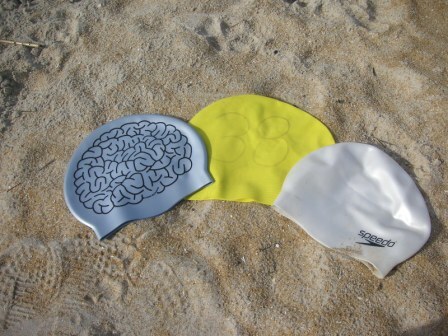 Do you wear swimming/bathing caps? How many? What colour? Or do you go ‘bald’ all year?